After really binging this weekend (why, oh, why?) I felt the need for something healthy for dinner today. 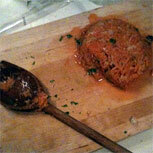 I landed on carrot patties – made from the same principle as hamburger patties, I guess, but without meat. 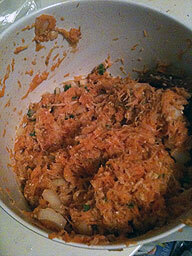 If you have a food processor, this is not a time-consuming recipe. If not, like me, you’re going to be spending some time shredding the carrots and potatoes. 1. Shred carrots, and potatoes if you haven’t done it already. 2. Finely chop the onion and parsley. 3. 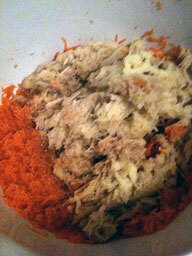 Mix all the ingredients together well in a mixing bowl, until it looks like a dough/thick mixture. The dough mixture. It kind of looks like a meaty mixture, doesn't it? 4. Take about a handful of the dough, and shape into a patty. (You might want to squeeze out some extra moisture – the carrots seem to generate quite a bit of it.) Do this until you have no more dough in the bowl. Look at that carrot juice, just flowing out. 5. 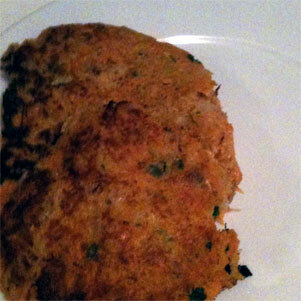 Cook them on a frying pan in margarine until the patties are nice and brown on both sides. I would have this either as the main “meat” or as a side dish to meat. 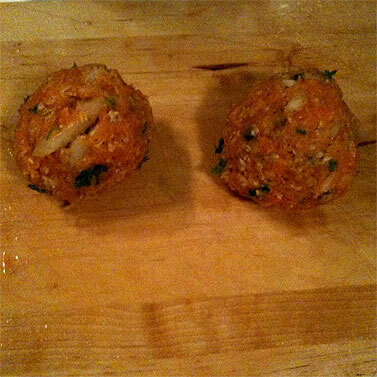 Make sure you squeeze the additional moisture out of the patties – carrots produce a lot of juice, I discovered, and it was easier getting some shape to the patties after the surplus juice was gone. Make sure you cook the patties long enough – keep them small in shape and not too big. My first patty was rather large, and it resulted in it being slightly undercooked, but only just so I could taste the raw potatoes, which was tasting too undercooked for me. The others were fine. Previous A review: Vivian Seving, etc.